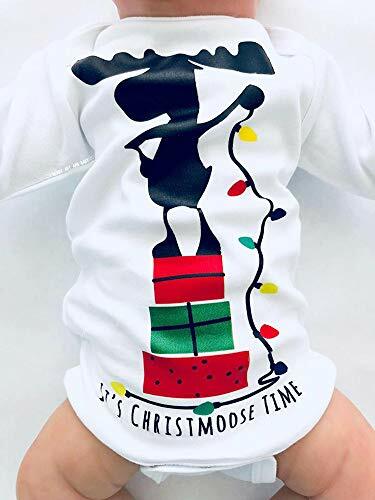 "It's ChristMOOSE Time" baby outfit is perfect for the Christmas season! This outfit features a cute moose stringing lights on a thick, warm, cotton bodysuit. An adorable outfit for baby boys and girls for those must-have holiday photos! Our unique design is professionally printed on soft, breathable cotton. WANT THIS OUTFIT IN A DIFFERENT SIZE? WANT TO SEE MORE FROM OUR SHOP? Please note that due to a variety of monitor settings, the color of the garment as seen on your monitor, may slightly vary from the actual color. If you have any questions about this product by I Heart Art and Baby, contact us by completing and submitting the form below. If you are looking for a specif part number, please include it with your message.